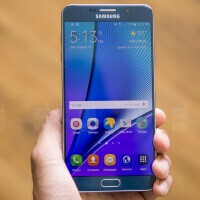 You can't be a true Note5 power user if you have not yet rooted the smartphone and installed a custom recovery to take advantage of all the clever hacks, custom roms and tweaks that the developer community has come up with. Jailbreaking the Samsung Galaxy Note5 isn't difficult. It boils down to flashing Manh_IT's Noble Kernel, which is the first kernel for the device to support auto-rooting, BusyBox, and a deep sleep fix. You shouldn't lose any personal date from your phone, but be sure to make a full back-up, just in case. Also, there's a pretty good chance Samsung Pay and the KNOX security system will cease working, as rooting the smartphone compromises its protection. Finally, Noble Kernel only works on SM-N920T and SM-N920P variants of the smartphone, while SM-N920I and SM-N920W8 ports are being tested, so check your Note5's model number beforehand! With this in mind, let's get "power user" on the Note5! First, download the appropriate kernel for your phablet on your computer: N920T or N920P. Then, download Odin 3.10.7 (link). This is Samsung's phone flash tool, and we'll be putting it to good use here. So, go ahead and extract the Noble Kernel and Odin zip files. Launch Odin and click on the AP button. Choose the folder that contains your extracted Noble Kernel. Then, power off your Note5, and press the volume down, power, and home buttons at the same time to put the phone into Download Mode. Now, connect the Note5 to your PC and click the Start button in Odin. Noble Kernel will get flashed, your phablet will be rebooted, and all that's left is to install SuperSU from Google Play. You will gain root access after updating the SuperSU binary. Next up, installing TWRP. First, download TWRP 2.8.7.1 for SM-N920T/N920P from this link. Then, start Odin, click AP, and choose the tar.md5 file. Connect the Note5 to your PC and click start. You don't have to power it off or do anything special. When the process is finished, turn off the Note5 and press the volume up, home, and power buttons to boot into TWRP recovery. There you go, hope that works for you! Don't call rooting an Android "jailbreaking". Rooting and Jailbreaking are definitely not the same. I have at&t note5, never gonna get root on it. nope, not for at&t note5, since S4 every Samsung phone on at&t has blocked boot loader. I plan to root my Note 4 that I just purchased as most likely my last rooted device. I just wasn't impressed by any means with the Note 5. Once the Note 6 or s8 releases, I don't plan on rooting which ever of those devices I end up purchasing. For me it's not about the knox security as much as it would be about loosing the ability to use Samsung Pay. How to lose your warranty for you 800.00 + $ device. Samsung still warrants hardware failure, they just won't warrant software failure due to rooting. The same can be said about SquareTrade warranty. Nowadays it's very easy to restore a Samsung devices due to software failure but hardware failure is a completely different story. Just a friendly warning.....all the current kernels seem to suffer from random reboots. True story. I used the kernel listed above and my phone will reboot during phone calls. That seems to be the only time it happens though. Who told you that? Yes there are a couple that random reboots but there's also about three that are stable as hell. what are these extra features? i'm a total noob about rooting. what benefits would i get by rooting a note 5? The benefits are too many to count. Look at xda-developers.com for more ideas. I need major help after trying to root my note 5 my phone won't get past the Samsung screen and has in red on top left corner saying kernel not serinouied . Can some pls help me??????????? ?